Some things are just perfect, and in my opinion that goes for the Lip Nautic Ski Automatic. The folks in Besançon are making some great things, and this is just one of them. 38 mm of stainless steel provide a wrist bound dive suit for the Miyota 821A. Water resistant to 200 meters, internal rotating bezel, rubber and leather strap... this one is special. I particularly like the decision to go slightly smaller, it shows some character and belief in their design. 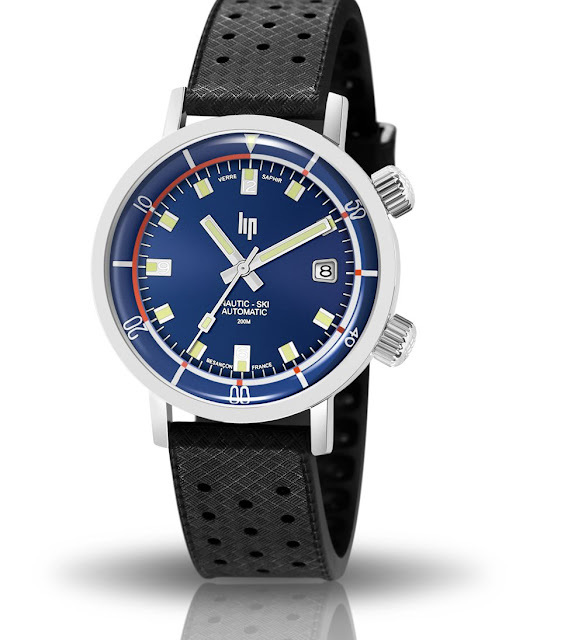 For now you can get this time keeping piece of awesomeness directly from Lip's online store for 499,00 €.